Google adsense is the leading online advertising network form websites, applications for windows, android etc., software, games and many more. Google adsense used to offer banner ads so far, but now it also offers Anchor/overlay and Vignette ads for mobile. 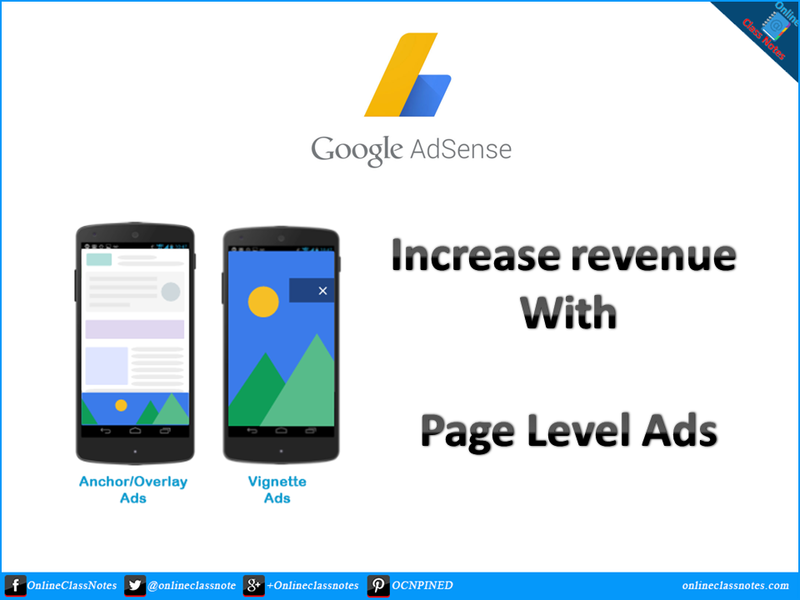 These ads are really awesome to improve your adsense revenue. Page-Level ads are those ads which you can't place at an exact place of your web page, such as footer or header or sidebar etc. Rather, they appear on their own optimal places. Such as the anchor ads will appear generally at the bottom of the screen and will stick at that position. Ads which appears at the edge of the screen of user's device and can be dismissed by user very easily. These are like footer ads we already know from other online advertising networks. Mobile full-screen ads that appear between page loads on your site and can be easily dismissed by your users. These are the Interstitial ads, as we know, full screen ads that covers the whole screen with a close button attached to dismiss the ad and return to content. Interstitial ads, by definition, Interstitial ads are full screen ads that cover the interface of their host application. They're typically displayed at natural transition points in the flow of an application, such as between activities or during the pause between levels in a game. In adsense, do not appear on the first page load, rather they appear when user start to navigate. 1. These ads appear at an optimal time decided by adsense itself. That is, the ads will not appear every time you load the pages. 2. These ads do not count towards the 3 ads per page limit. That is you can still have your 3 banner and 3 link ads on your page, along with page-level ads enabled. Cool. 3. And again, like in point 1, these ads only appear on high-end mobile devices. 4. Also, limited in number of times they appear per session to maintain a good user experience. Consider that you have to close a full screen ad every time you click on the links of a page, how disgusting this will feel. So its a nice step by google adsense. Anyway, to enable page-level ads for your google adsense account, you need to have a non-hosted account. Go to your google adsense account and then to My Ads tab. On the left sidebar, Under Content find Page-Level Ads. The ad code will appear in the similar fashion for other ads. Place this ad code in the <head> tag (or at the top of the <body>) of the pages where you want to show the ads. It’s the same ad code for every page and site, and you won’t need to change it even if you adjust your Page-level ads settings. Well, as already been said, visiting from a mobile device doesn't guarantee that you will see a page-level ads appearing. So to test if you placed the code correctly or not, visit your website in a mobile browser and add #googleads at the end of the URL. For example, if the URL you want to visit is http://mysite.com, then visit http://mysite.com#googleads. 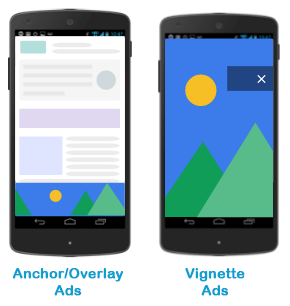 You will see two options appearing for Anchor/overlay and Vignette ads. 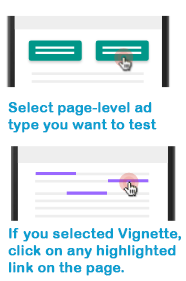 You can test one type of page-level ads at a time, so select one. If you select Vignette ads, then you will most of the links in the page will be highlighted with background colors and borders, you have to click any one of them to see the vignette ads on action.